Hail to Thee, Okoboji U! is a collection of articles, stories, poems, and cartoons that pokes irreverent fun at higher education. Nothing is sacrosanct; everything is fair game: admissions procedures, intercollegiate sports, student affairs, professors, college presidents, commencements, alumni affairs, fund-raising and the cirriculum-English, music, art, history, philosophy, science. The anthology includes some of America's most distinguished writers and artists, including: Woody Allen, Richard Armour, Russel Baker, Jeremy Bernstein, Roy Blount, Jr., Robert Benchley, Peter DeVries, Max Eastman, Jules Feiffer, John Kenneth Galbraith, Randall Jarrell, Fran Lebowitz, Henry Martin, Don Marquis, Mary McCarthy, Ogden Nash, Vladimir Nobokov, Samuel F. Pickering, Jr. John Crowe Ransom, Leo Rosten, Frank Sullivan, Delmore Schwartz, James Thurber, Calvin Trillin, Garry Trudeau, Mark Twain, Kurt Vonnegut, Jr., and E.B. White. Though higher education is universally renowned for fostering prodigous learning and wondrous knowledge, Hail to Thee, Okoboji U! is a reminder that eminent intellectual institutions are often caught in the meshes of the nonsensical and the ludicrous- the querolousness of faculty meetings, the posturing of college presidents, the banality of commencement speeches, the inanity of arcane scholarship- and therefore, an institution's important personages had best not take themselves too seriously. 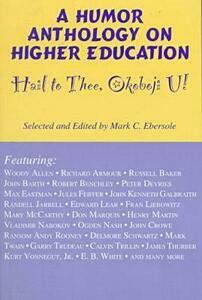 Hail to Thee, Okoboji U! offers a light-hearted look at the groves of academe and appeals to administrators and faculty members, graduates and students, and all who would like to have an insiders look at what goes on in the ivory towers.